With the start of the 2013 Formula 1 season, a question has come to mind that I haven’t put as much thought into as I should have over the previous seasons: Who am I rooting for? Ever since the likes of Prost, Hakkinen and Montoya left the F1 paddock I haven’t had a driver I really root for. There are drivers I like more than others but I decided now was the time to figure who I would really start rooting for. I first though about Jensen Button; as time has gone on my thoughts on Button have changed. A first I viewed him as too much talent too soon and he wasted it at BAR only to be saved by Ross Brawn. When he jumped to Mclaren I expected him to get swallowed up in what was Lewis Hamilton’s team. I was dead wrong as it was Jensen who developed into the poor man’s Alan Prost and it was Lewis who took the money and ran to Mercedes. I grew up a huge Prost fan and Jensen on his day is the modern day Prost; driving the perfectly calculated race with minimal wear to the car or tires. Those days however don’t occur enough for me to really root for Jensen, as there are times he’s completely lost out there in a top-flight car (see the second half of the Brawn year and points of his Mclaren career). My next thought was Jensen’s former teammate Lewis Hamilton. Make no mistake, Lewis is possibly the most naturally gifted driver in F1 right now however I’ve never really warmed up to Lewis as a person. To me he gives off the vibe of being entitled; here is a driver that was taken under the wing of Mclaren at a young age and given the best equipment at whatever level of racing he was at. Whenever things went wrong at Mclaren it was never Lewis doing some soul searching but instead blaming others. Perhaps this shows with Jensen entering what was Lewis’ team at Mclaren and now Jensen remains while Lewis took the money and moved over to Mercedes. Speaking of money, I feel Lewis is set to become the next David Beckham (he shares the same XIX Entertainment management as Becks) in that it’s all about building the brand “Lewis” and making as much money as possible. Here are two athletes first known for their success in their sport but are later known for being a brand. So what about the man Lewis considers his main rival: Fernando Alonso. If Lewis is the most naturally gifted driver in F1, Fernando is the most complete driver in the paddock. A man who never puts a wheel wrong and can take a sub par car and make it a winner. It’s a bit shocking to realize that his last world championship occurred in 2006. Despite his talent, controversy tends to follow Fernando where he goes especially during his Mclaren year and the Renault crashgate scandal; the former being the biggest turnoff in thoughts of supporting Alonso, however the talent is to be respected. This takes me to the three-time world champion Sebastian Vettel. I find Vettel to be a bit like another multi-time German world champion, one Michael Schumacher. Like Schumy during the Ferrari years, he’s a great (but maybe not the most complete driver in the field) in what is the superior car in the field. I’m not knocking Vettel as he was identified as future star long before he joined the F1 paddock. He also shares with Schumy that smiling face with a demon inside that says: “I’m going to have the best of everything and I don’t care about my teammate” feeling. Perhaps it’s what makes the greats. For me, Vettel’s turnoff is Red Bull. As much as the team publically denies it, he is their number one driver and they will gladly screw Mark Webber for him (see Silverstone 2010). That brings me to the man who offered the quote of the 2012 F1 season when he told his team to leave him alone as he knew what he was doing: Kimi Raikkonen, the driver I will be rooting for. What I love about Kimi is that he’s human, he’s flawed. The great Nigel Roebuck one said that the Ferrari team felt they only got a handful of great drives out of Kimi when he was with them. He doesn’t have the desire to give his heart and soul 24/7/365 to F1 and would like to go out on the town and maybe wakeup once in a while with a hangover. He’s a maverick who was born in wrong era, a man who should be been a contemporary of Hunt instead of running a tribute Hunt helmet. Kimi is not interested on stealing the show at the Autosport awards like Vettel or building the brand like Lewis. Kimi just wants to show up, drive the car, win the race and go home. For a man who has made a lot of money in racing, I don’t think Kimi is motivated by money alone, I do think he wants to be fairly compensated, have competitive equipment and left alone. 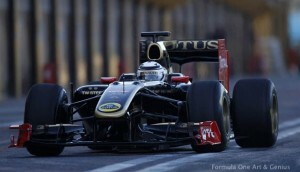 Lotus, is the ideal place for Kimi. He’s not under the thumb of Ron Dennis and required to be the perfect driver on and off the track like his Mclaren days nor does he have to be the driver that motivates the workforce and all of Italy like what is required of a Ferrari star driver. At Lotus, Kimi is left to being Kimi, driving the car and that is all. I’ll be a realistic, I don’t expect Kimi to win every race, there will be weekends when he’s off but the weekends he’s on. I will cheer him on and enjoy the last human star in F1.